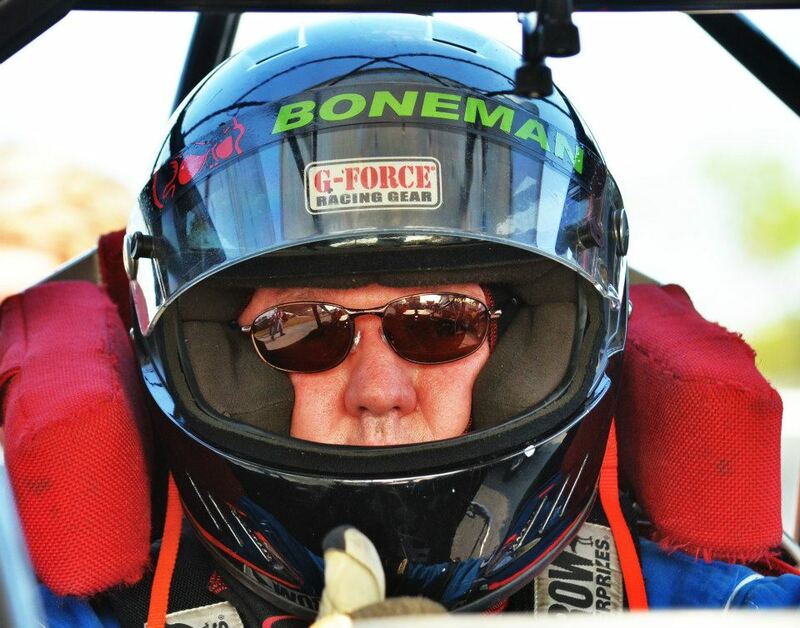 Joe Winchell had his game face on! 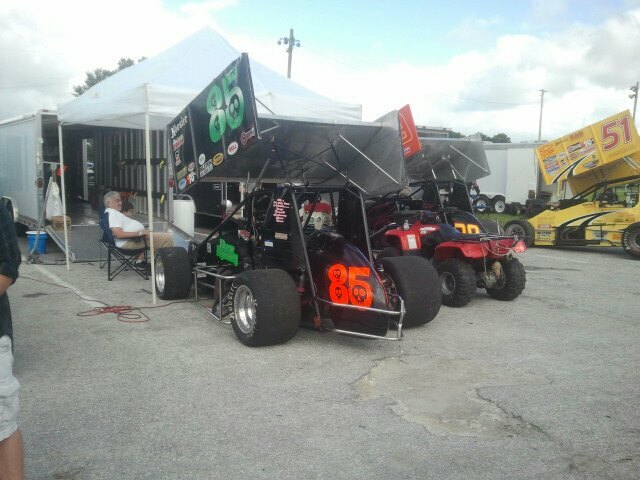 Sprint car guys in the house! 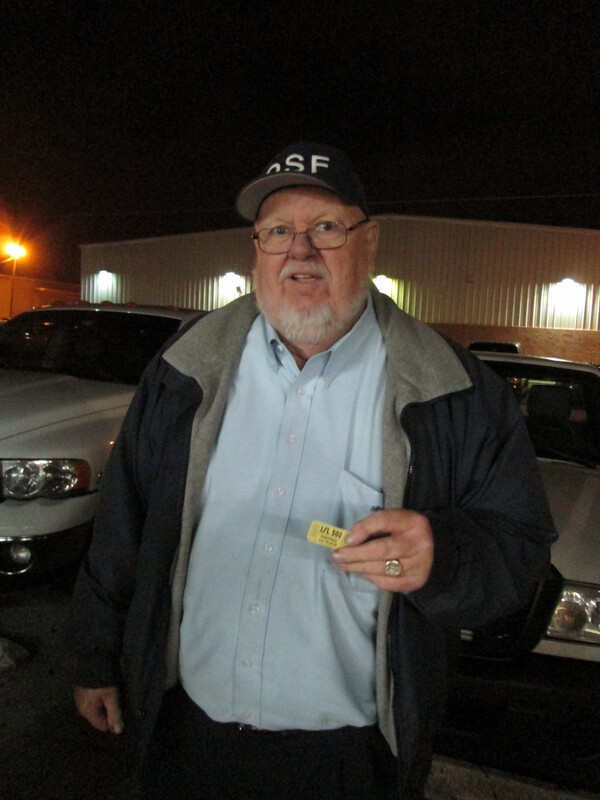 Look who ended up with a winning ticket: super fan "OSF"! 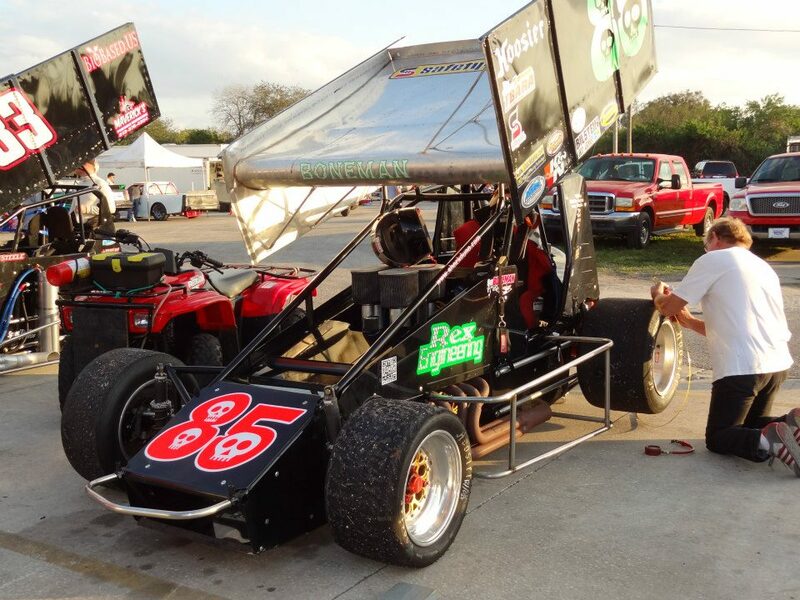 There goes Ron, turning the wrenches! 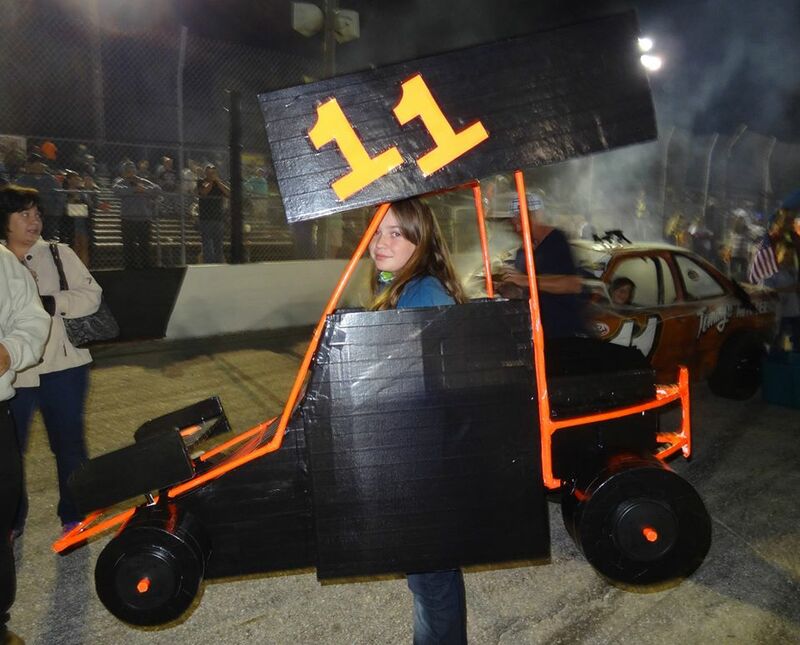 fan just before the feature. 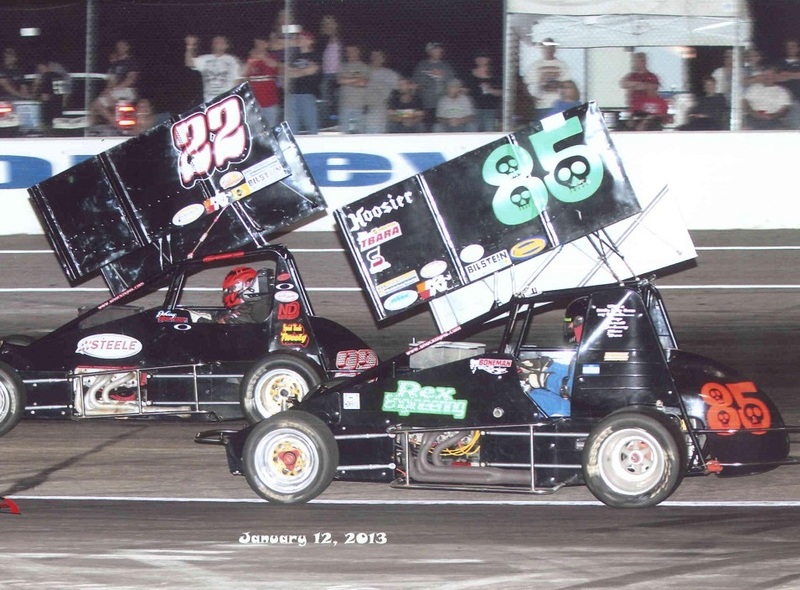 Trying to hold off Johnny Gilbertson. I started 13'th out of 18, and finished 9'th. Back in one piece and I had a good night! 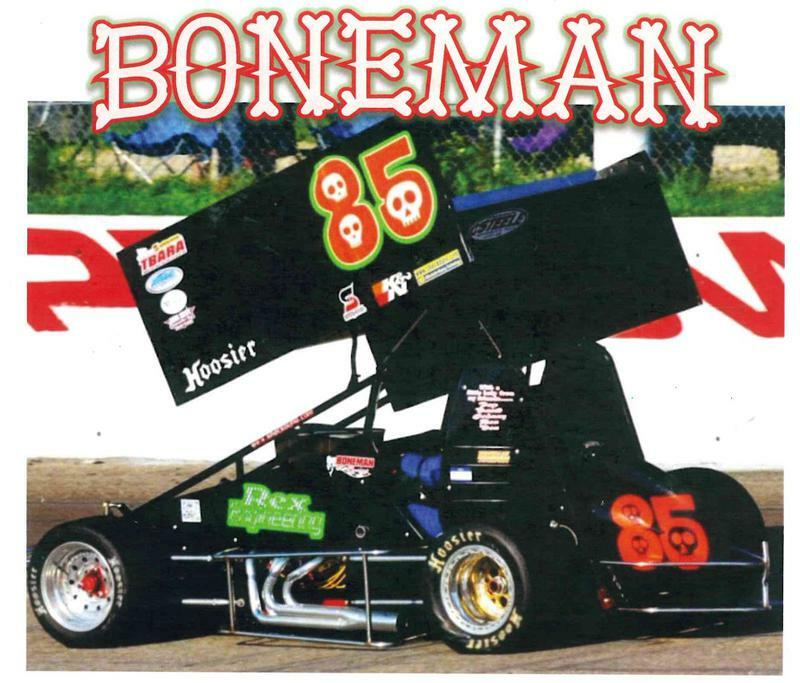 I spent two nights crewing for Johnny at the East Bay 360 Nationals. Fun....but tiring! 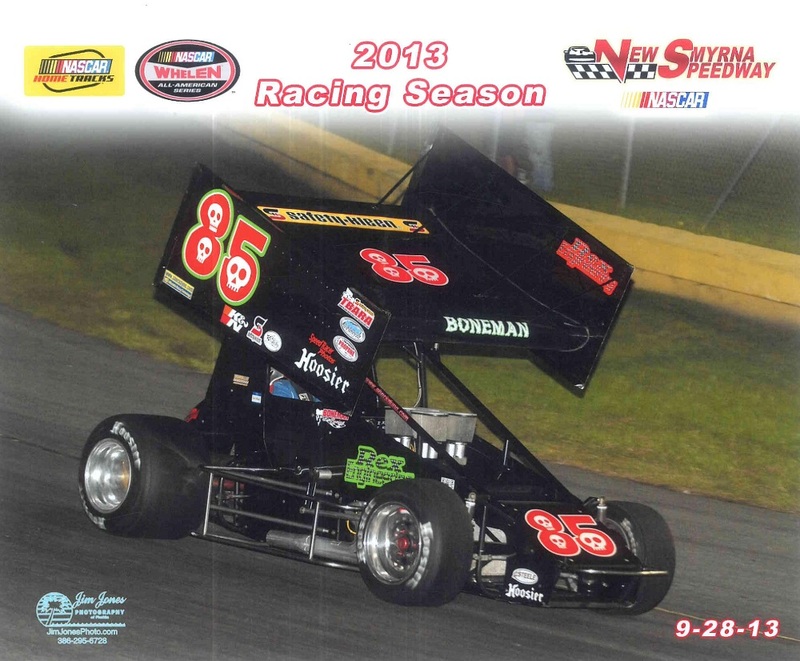 10 weeks later......I finally got to race again! 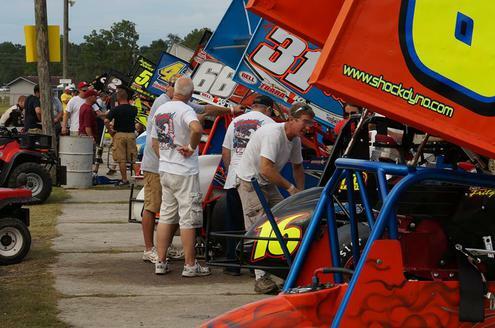 We were back at Showtime Speedway. My grade should be an "A" for consistancy, and "B-" for performance, because I qualified 10'th, started 10'th and of course finished 10'th. 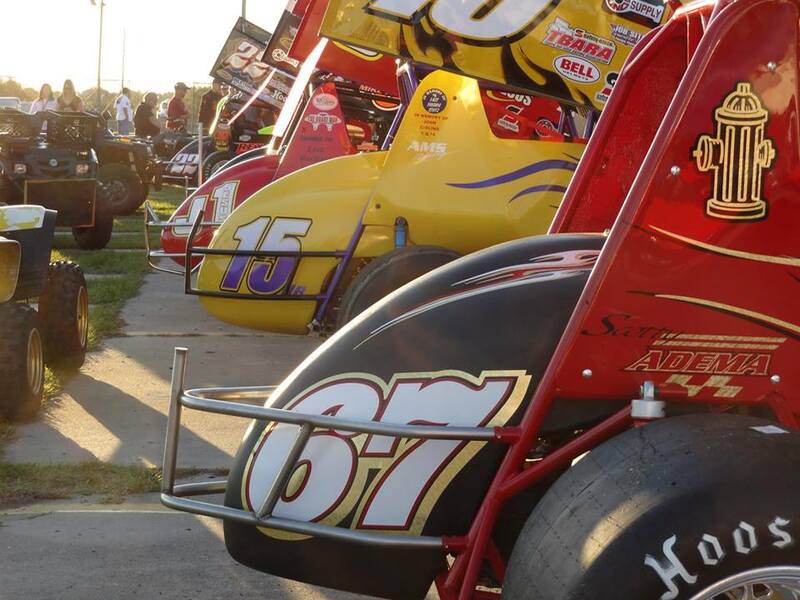 We had 18 cars tonight, and I was going ok, but made a driving error and 3 guys got past. Oh well, I had a great time. 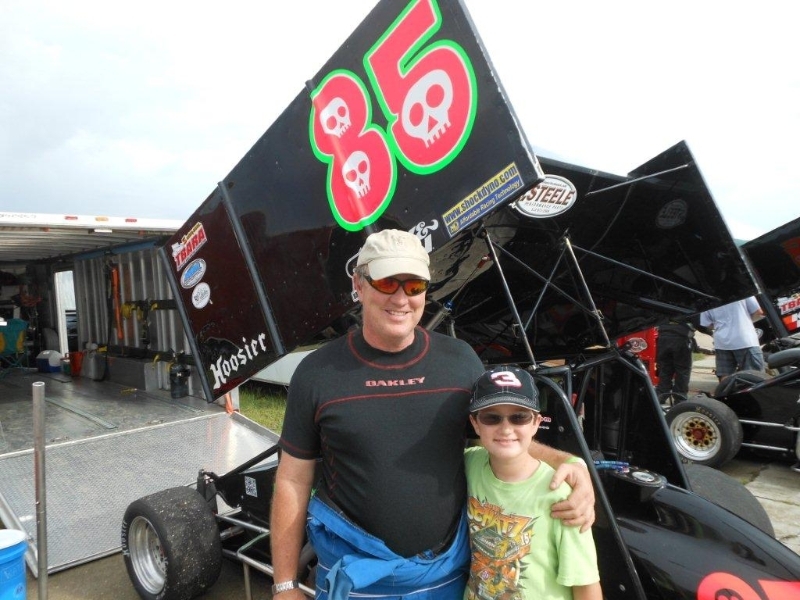 Tonights team: Ron and my son Steven! 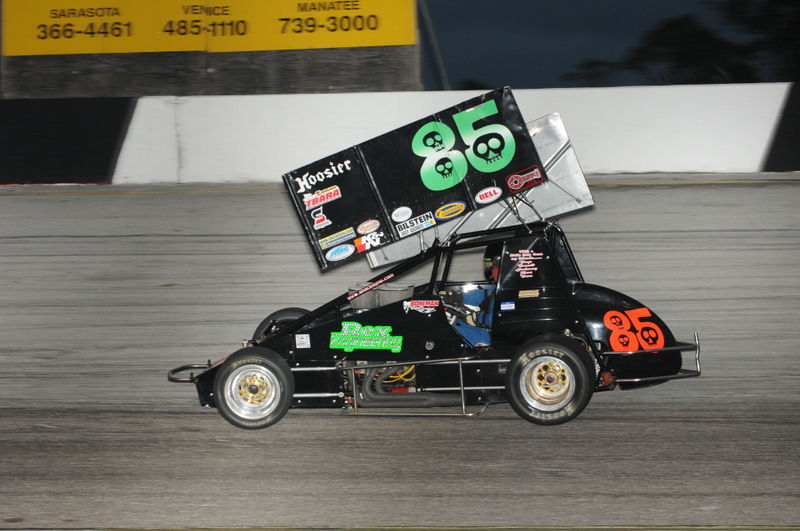 The 7'th edition of Little 500 Night went green on Friday, 1-18-13. 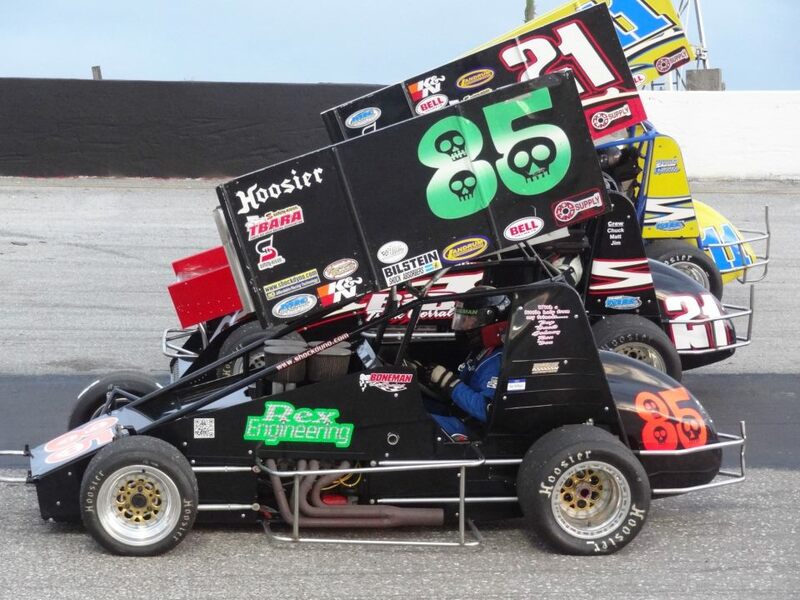 Back to Showtime Speedway for a great night! 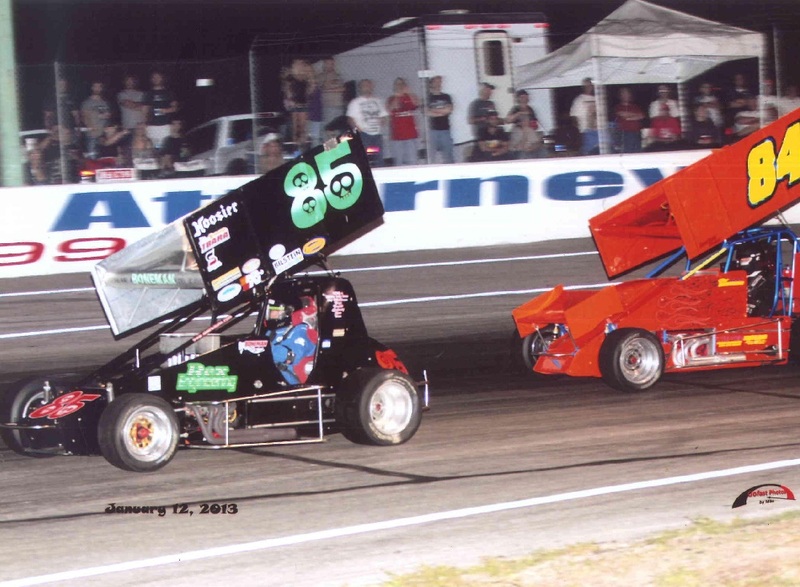 They featured winged sprints, a figure "8" 50 lapper, Outlaw Modifieds and mini stocks.....all my favorite stuff! Once again, I didn't qualify very well, but the race went ok. Actually, I got involved in my first yellow for 1 1/2 years; someone punted me in the left rear wheel. Although that car went off on the hook, mine was ok and I finished 9'th. Steven was my 4-wheeler pilot tonight! 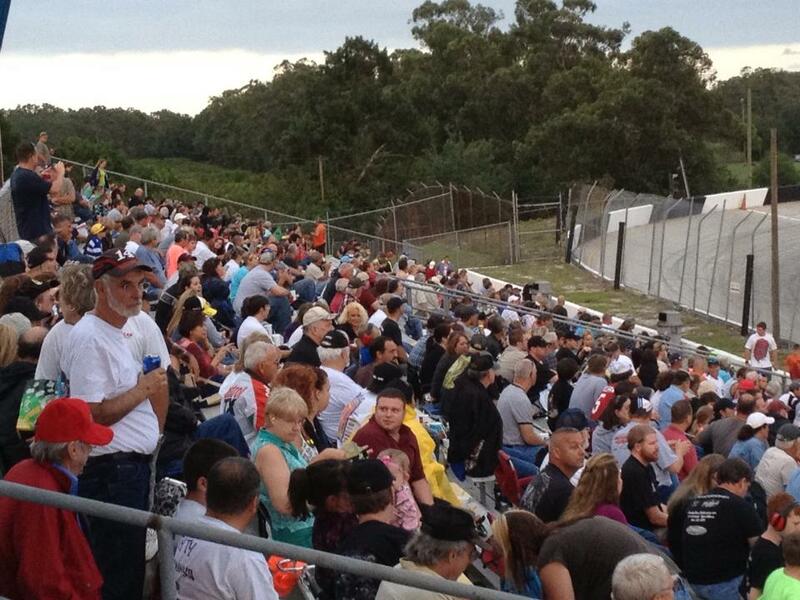 Full Throttle Speedway opened its doors to a packed pit area and a ton of fans! 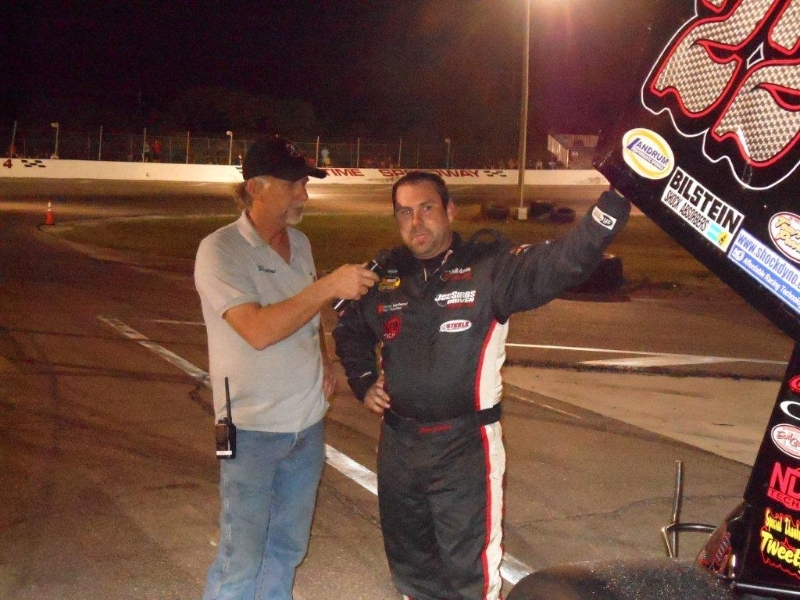 TBARA showed up with 23 cars, and we 3 heats and a very fast, green to checkered feature. 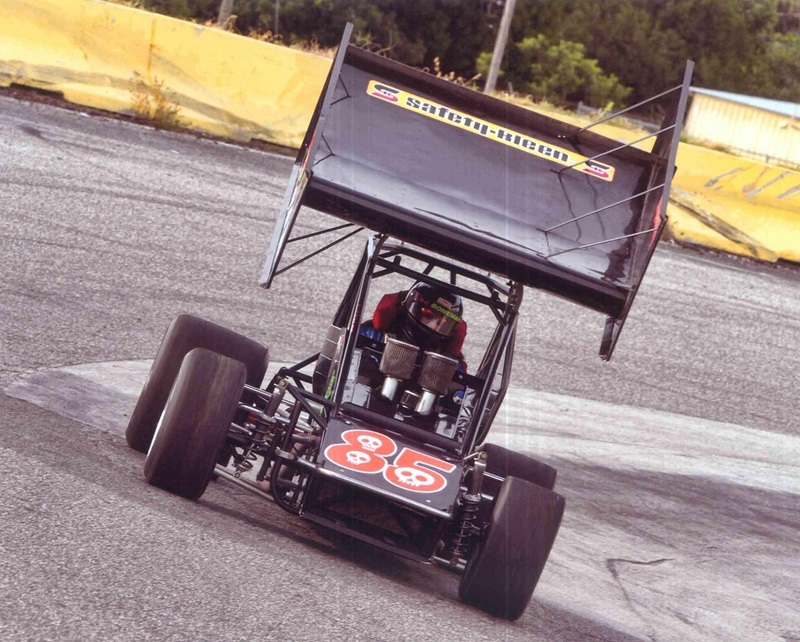 I had front-end trouble in practice, but we fixed it and I started in the back of my heat. 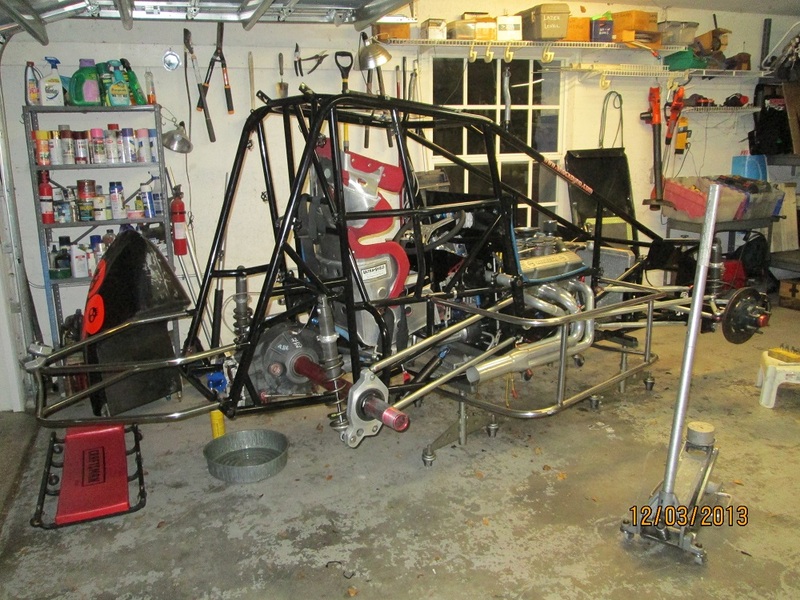 The repair was successful, so I lined up toward the back of the feature and finished 13'th. 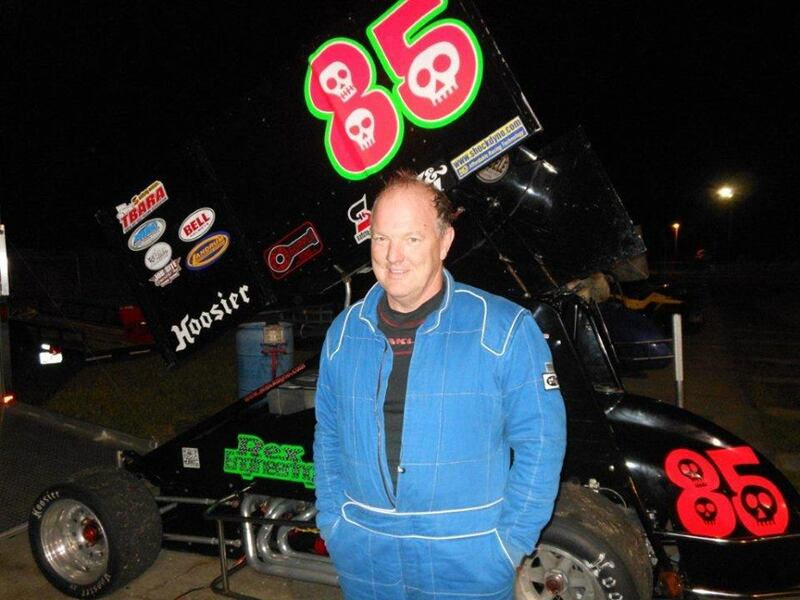 The only problem of the night was that one of our TBARA members and friends, Geoff Styner, was critically injured in a TQ midget. Geoff was supposed to race in our class too, but ended up getting airlifted to the crash house. He is on the mend from a broken neck, but it is going to be a long recovery. A beautiful shot by Gene Marderness! 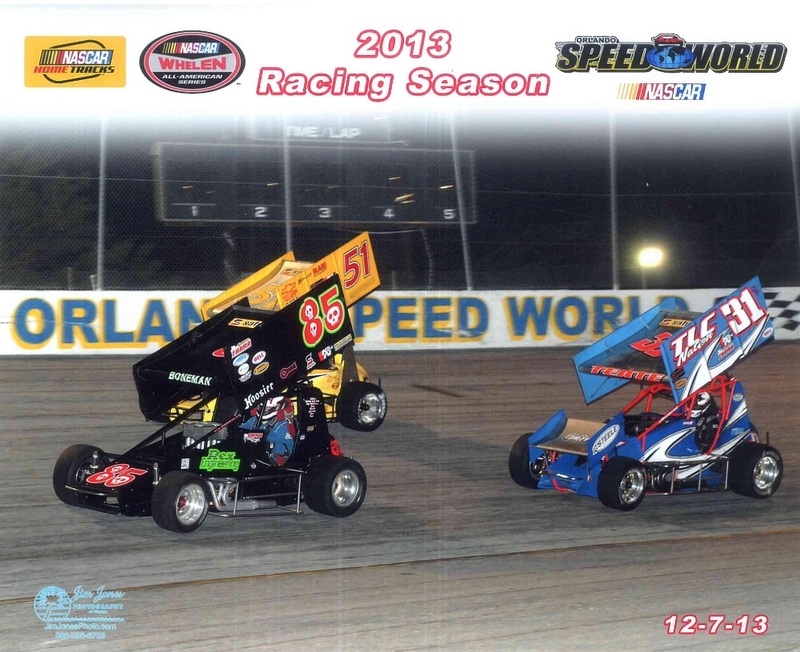 TBARA made its first visit back to my home track, Orlando Speedworld. It had been several years since the club raced here, and it would be my first time here in a sprint. 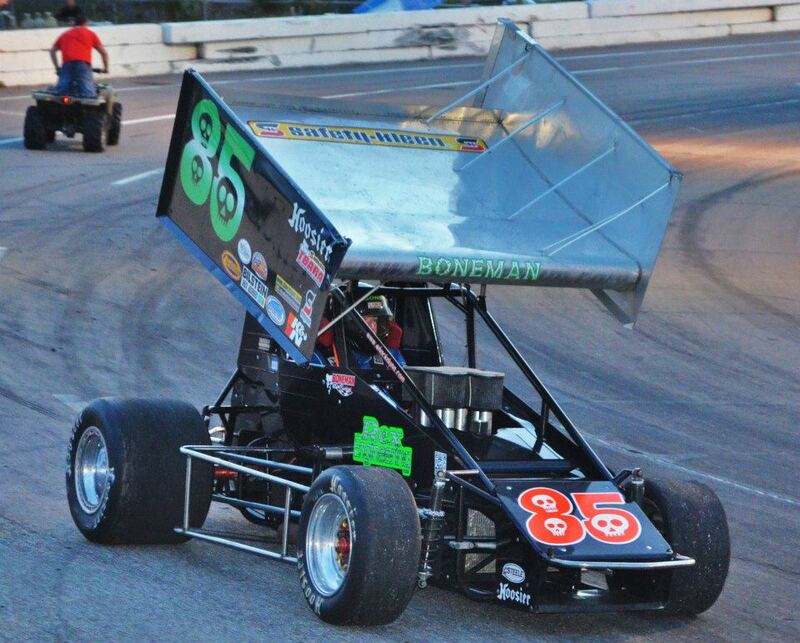 I took a few laps the week before during intermission to show the fans a sprint car, and then took a few more during a live TV news remote from the track. The only problem was the weather! The forecast all week was for lots of showers, and sure enough the sky opened up at 7:15 and washed out the show! We are rescheduled for 8-3-13. 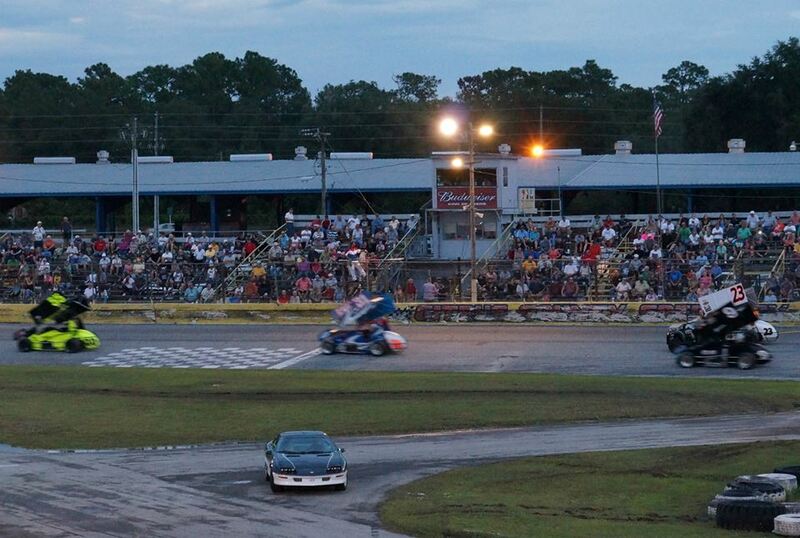 Citrus County Speedway is always a good stop for TBARA, this race was no exception. 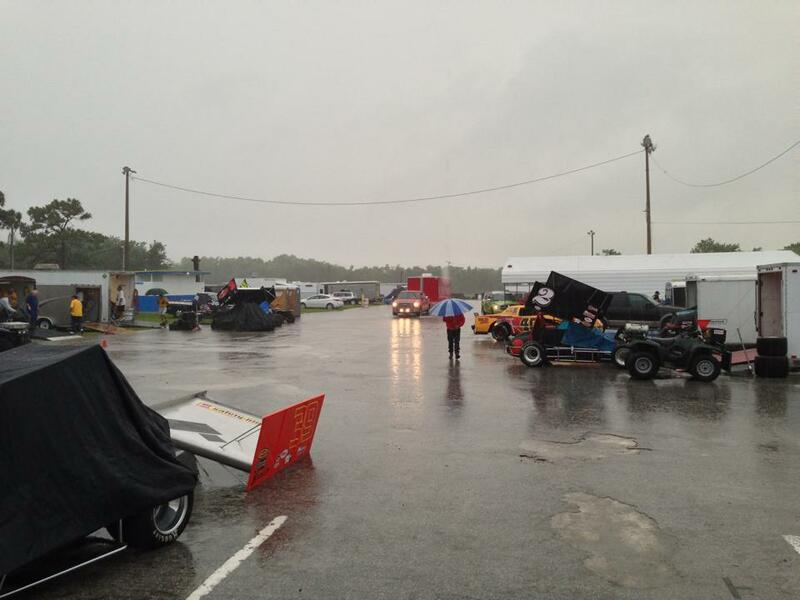 We waited out a hard rain storm in the afternoon, but they dried the track we were in business. 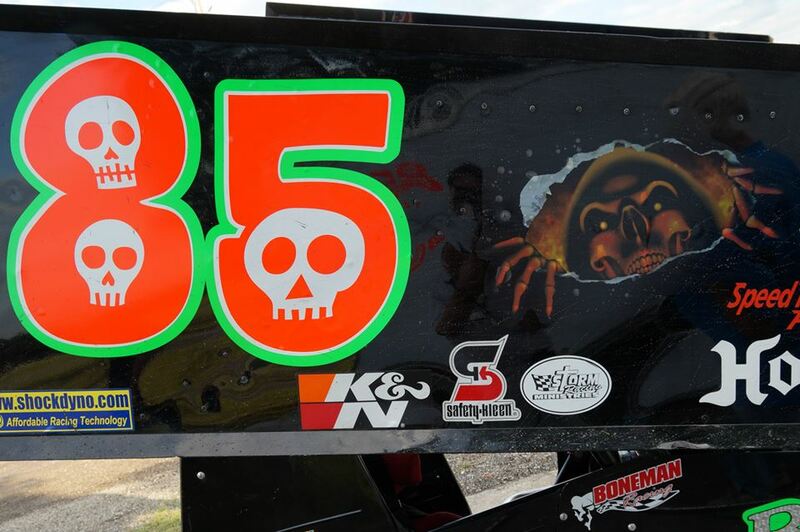 I had a new wing on my car, and everything worked pretty well all night.......almost everything. 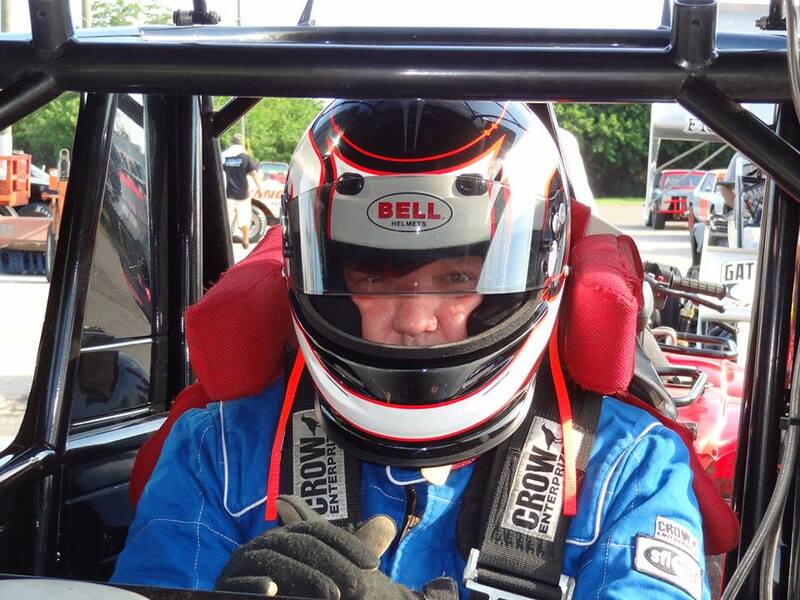 I started on the pole for the heat race, but got jumped (I am "buiding experience") and fell back. I think I started 13'th in the feature, and my car was pretty fast. I thought I'd move up, but after just a few laps, my car began to tighten up. It got steadily worse and I got slower and slower, eventually finishing where I started in 13'th. 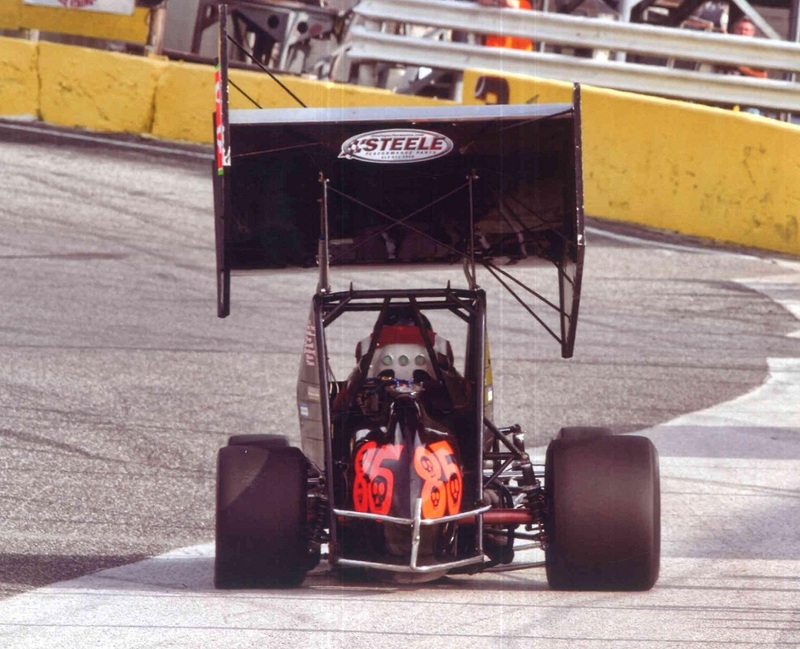 The problem was clear: my new right rear tire had a slow leak and was nearly flat by the end. 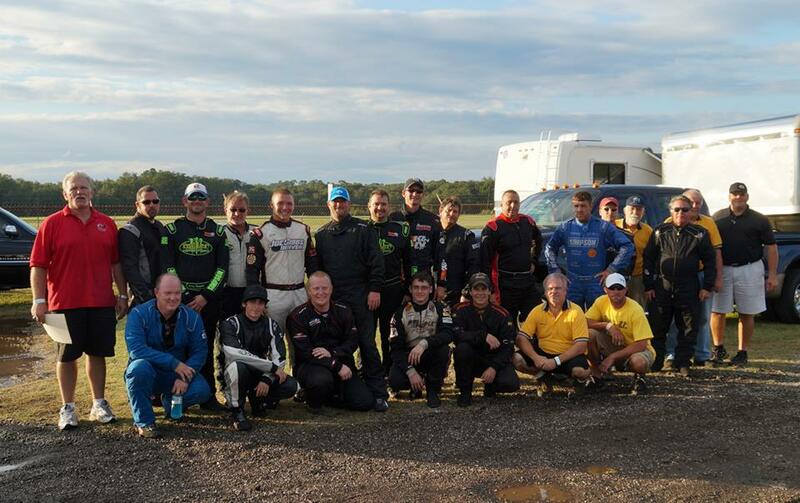 Oh well, at least everything is still intact for the next race, and it was a good night for club overall. After waiting through an entire summer of delays, rain and travel, I finally got to race tonight. Started 12'th and climbed through the field all the way to 11'th! 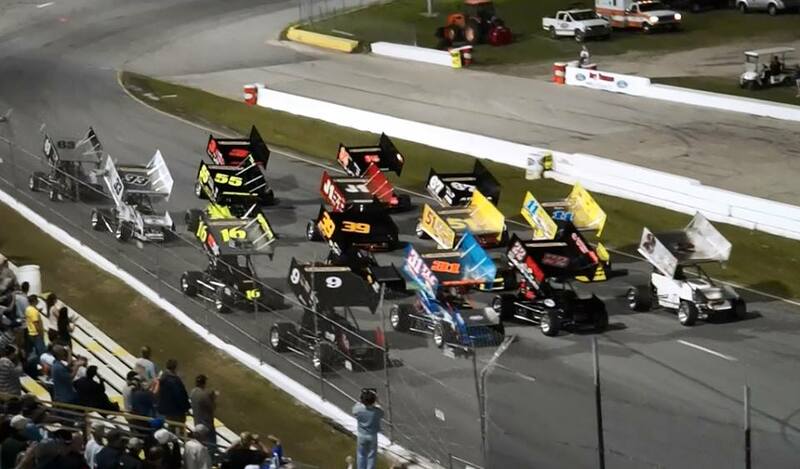 Oh well, I didn't run that bad and everything is ready to go on to the next event.....New Smyrna! 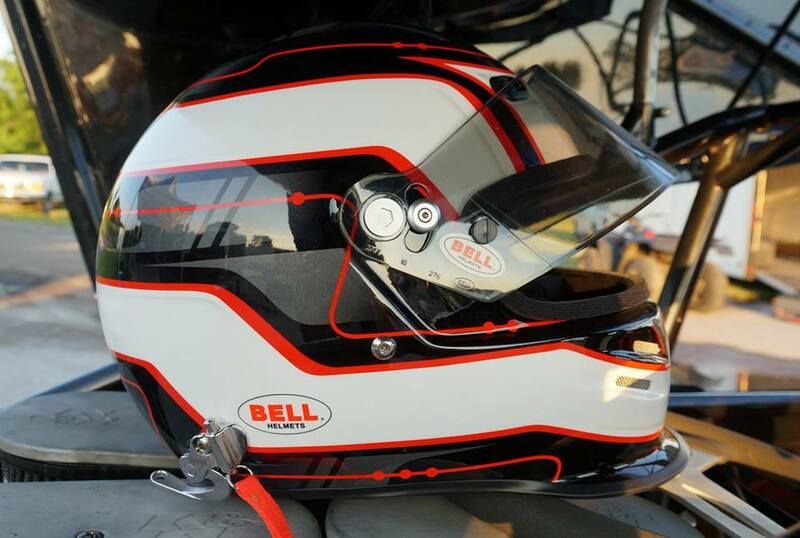 This was my first race using this new Bell helmet. It was the prize for winning Rookie of the Year in TBARA, 2012. 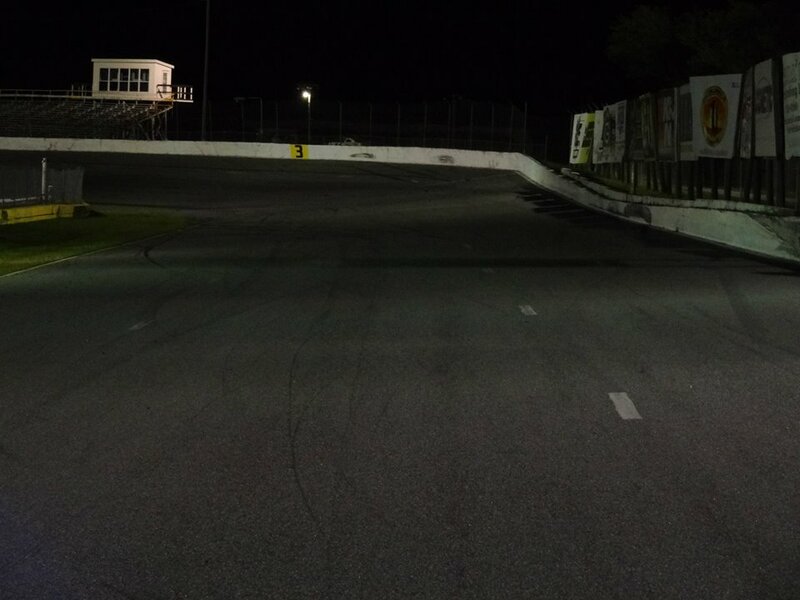 The TBARA made its return to the high banks of New Smyrna Speedway! It was my first visit there in this car, and I had a super time driving there. I ended up 9'th out of a field of 16. Not spectacular, but I found a few things to correct on the car, and I'll work on my driving, so I expect to go better when we return on Nov. 23. Our guest announcer for the evening was Hank Sanders (in the black shirt). 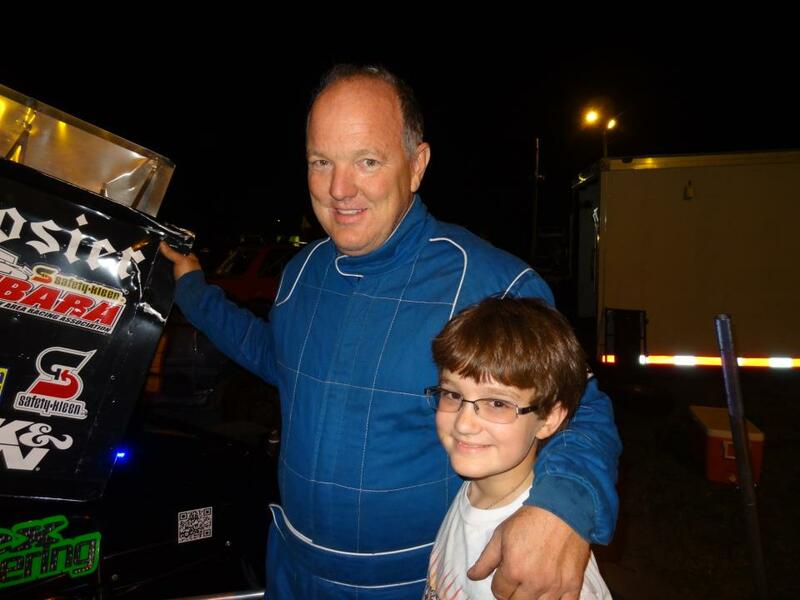 He loves sprint cars and did a super job for the track and our club! Look who is back! 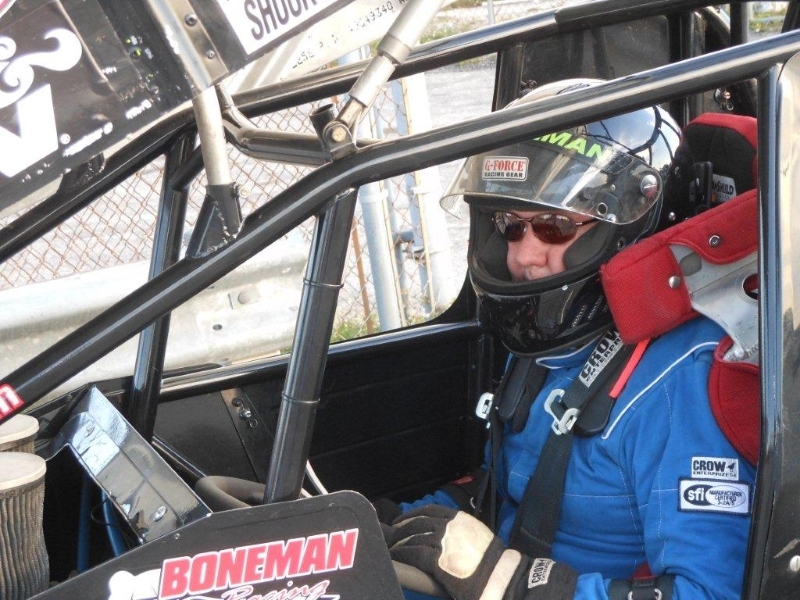 Geoff Styner is healed up after his terrible midget crash in May. 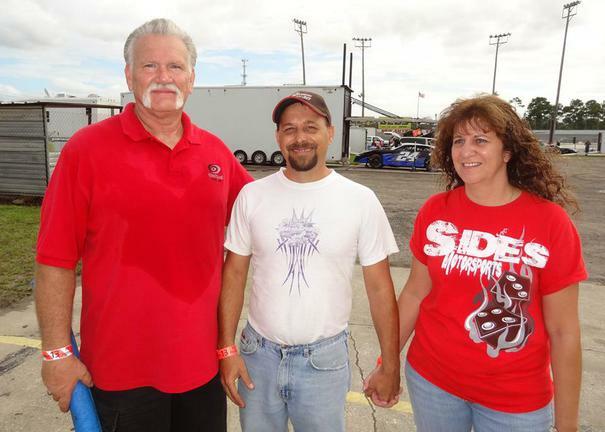 He is joined here by his wife Linda and TBARA president Buff Fritz. 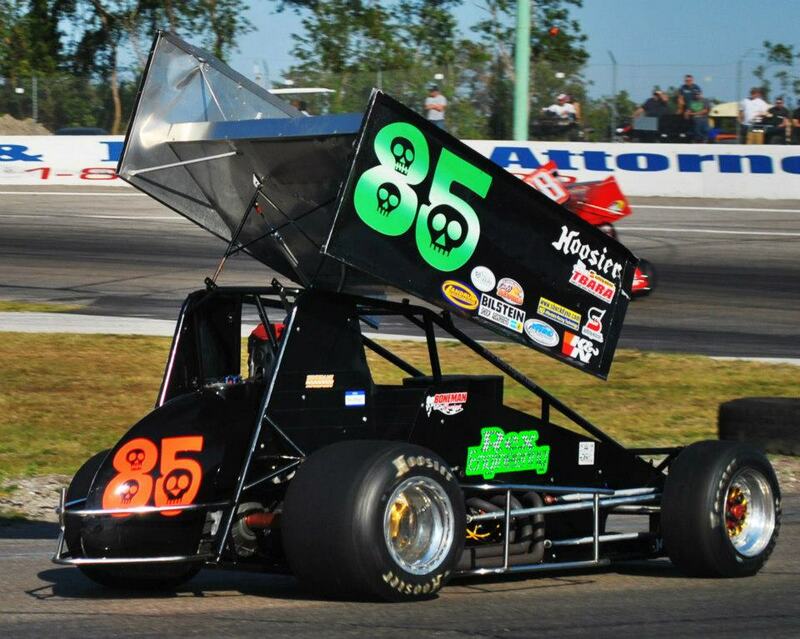 Buff was happy to be back racing! 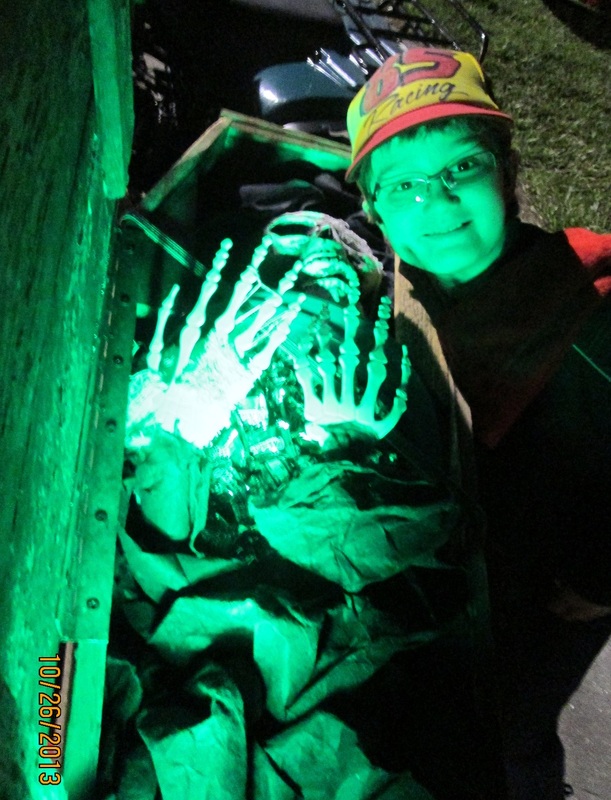 My Steven was there with his best buddy Matthew. Our night started out with a big rainstorm in the afternoon, then the heat and humidity set in. 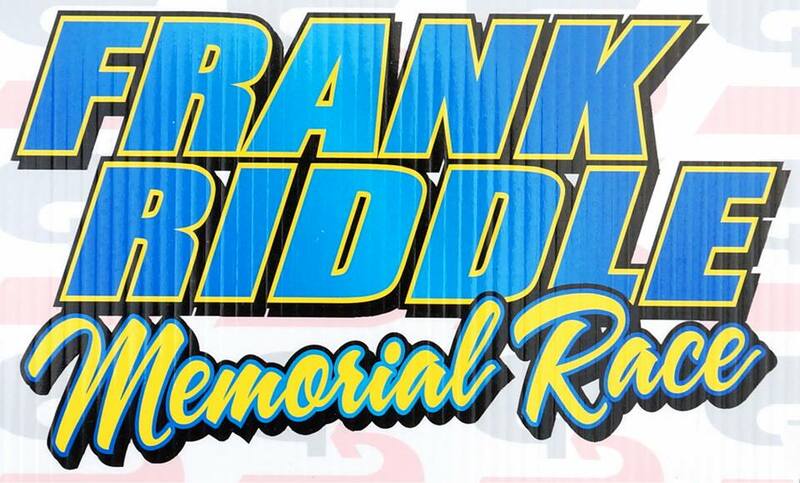 No problem, Citrus a great track fror sprinters and the TBARA assembled 19 of the best. Despite the afternoon storm, the track had an excellent crowd! 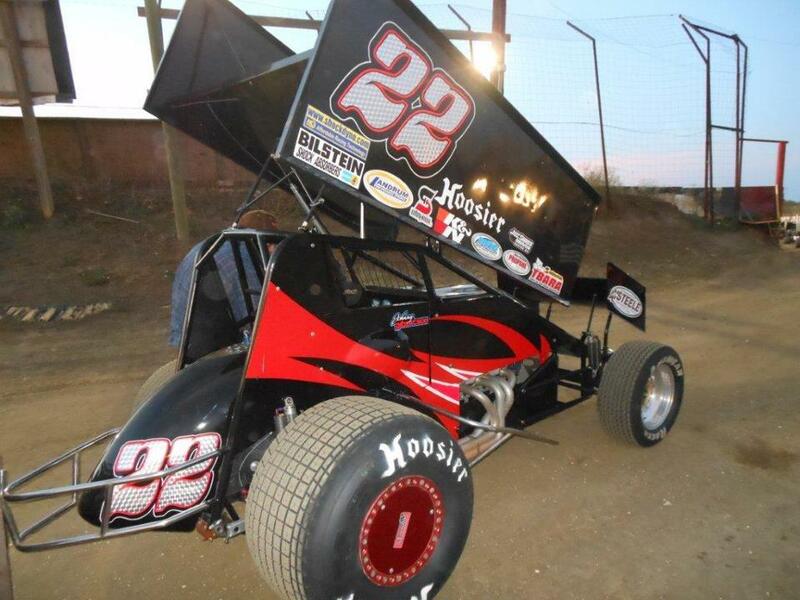 We chased mechanical issues all night, but finally got everything settled down and running right in the 30 lap feature. 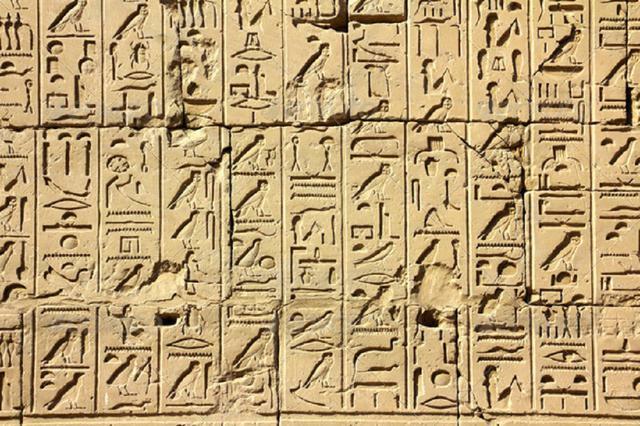 I started 14'th and finished 12'th. 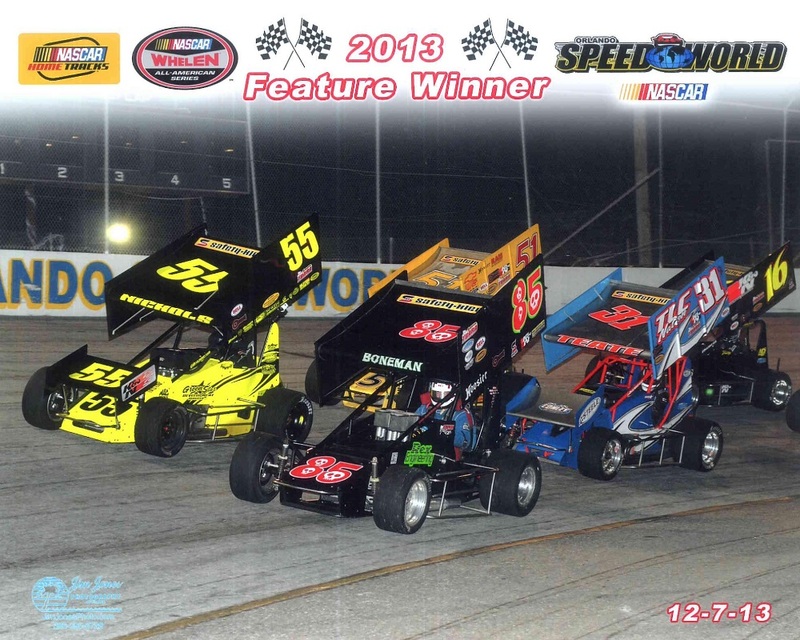 Its a 205 mile trip each way, but its worth it to race at Full Throttle Speedway. 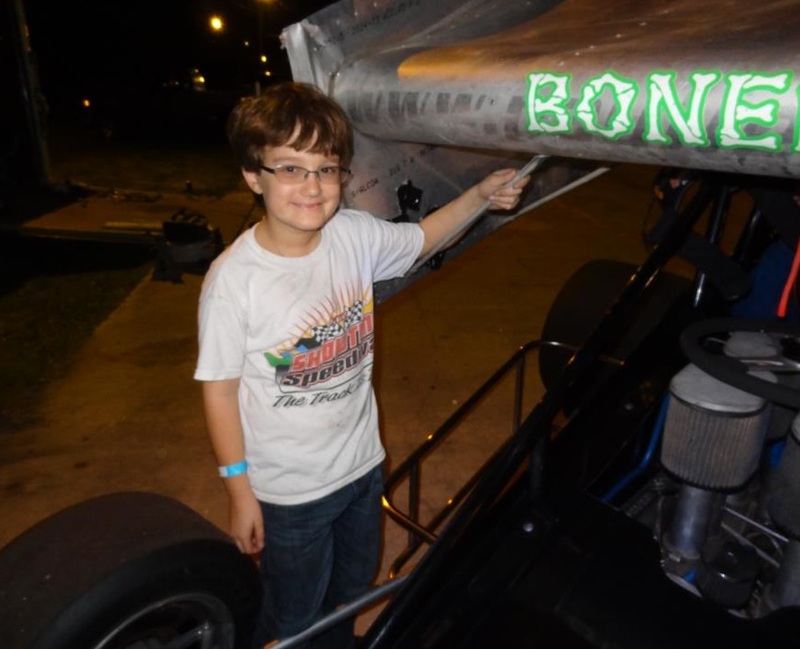 Halloween was approaching, so the track featured the TBARA sprints and "Trick or Treat the Drivers" for all the young fans. 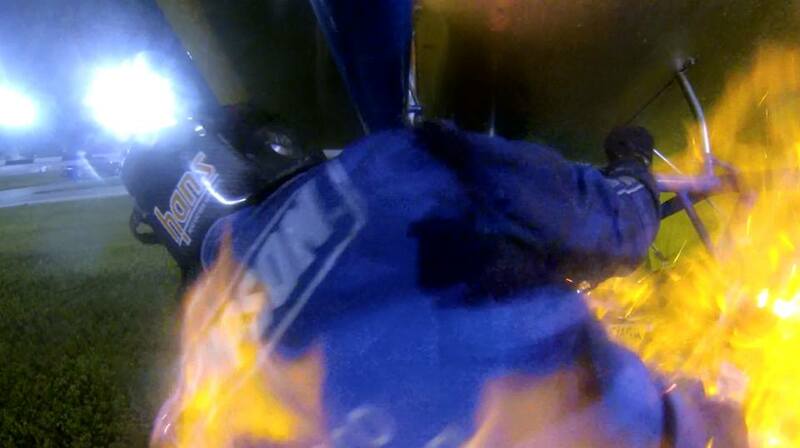 However, this night will be long remembered for a terrible sprint car fire in the first heat race. 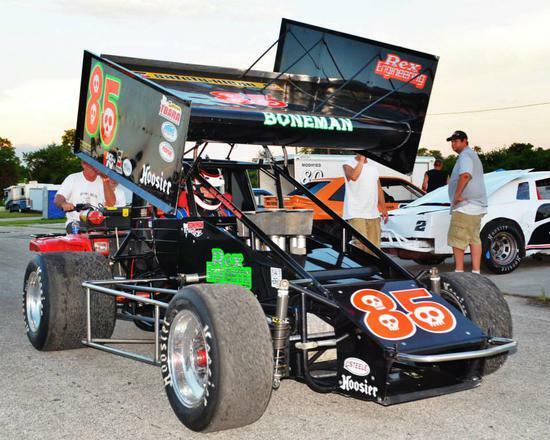 TBARA veteran Joey "the Ace" Aguilar saw his car go up in flames as he led the first heat. 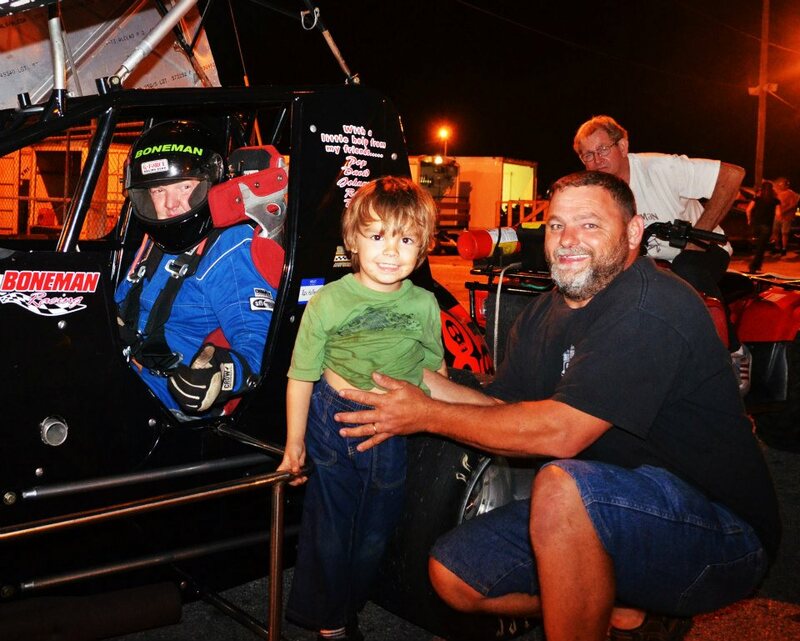 Thanks to his quick thinking, his good safety equipment, and the track fire crew, Joey escaped a horrible situation with burns on his hands, but he was home from the hospital by the time the races ended. What a close call! My wing was decorated for Halloween! Here it is.....a very scary video. 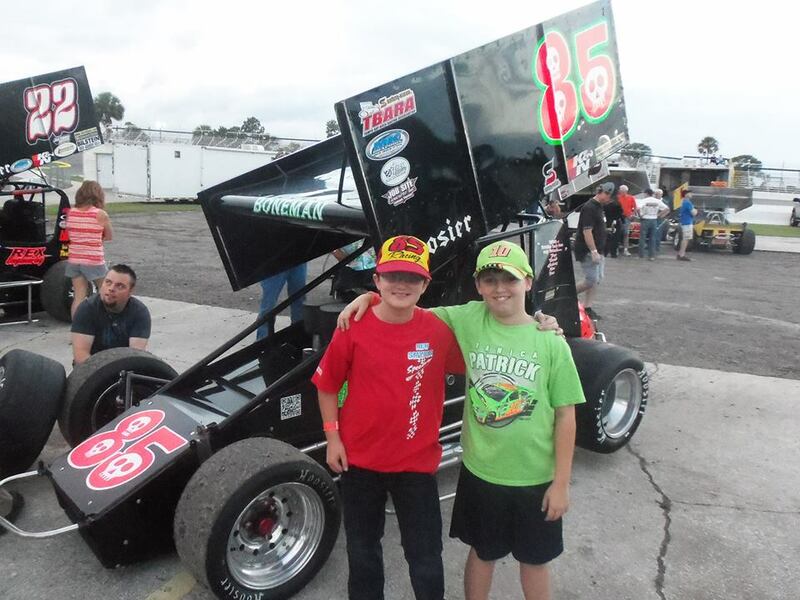 Steven, Ron McCreary and I all took our racers to a racecar show at our local wing place. 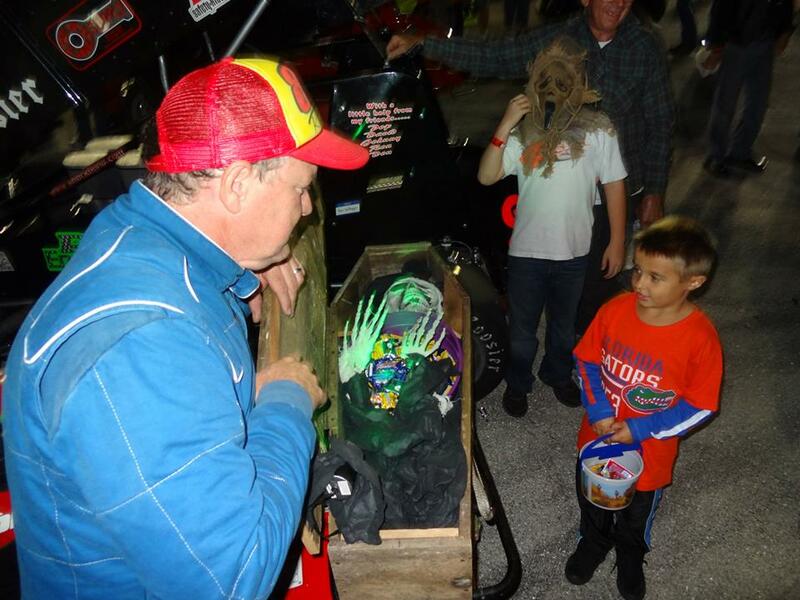 "Trick or Treat the Drivers"
The caption says it pretty well, but all around good guy, long time Florida racer and sprint car relative newbie Rex Hollinger has been a man hard at work at trying to keep his beloved Orlando SpeedWorld (OSW) alive and kicking. 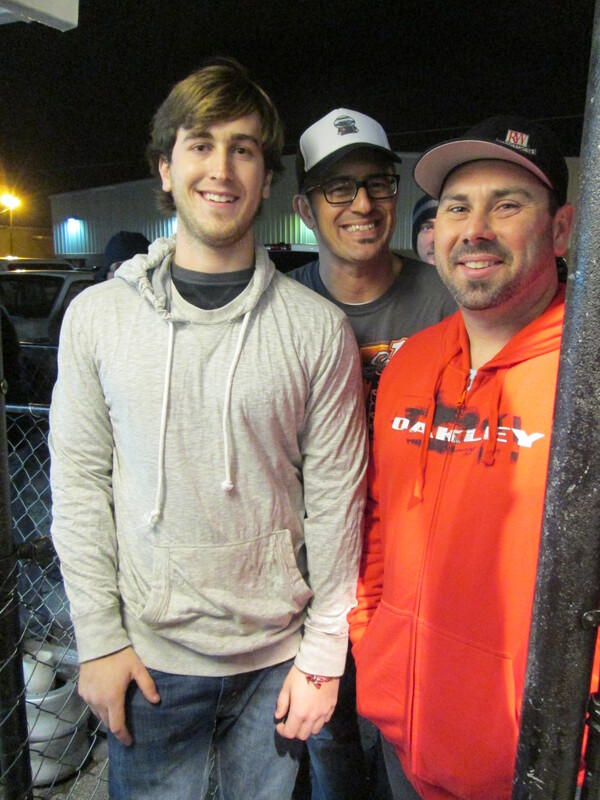 While this season has been a disastrous one for OSW, Rex recently got together with Ozzy Moya (the man in charge of the drag strip and the oval track) and his general manager Wade Rich. 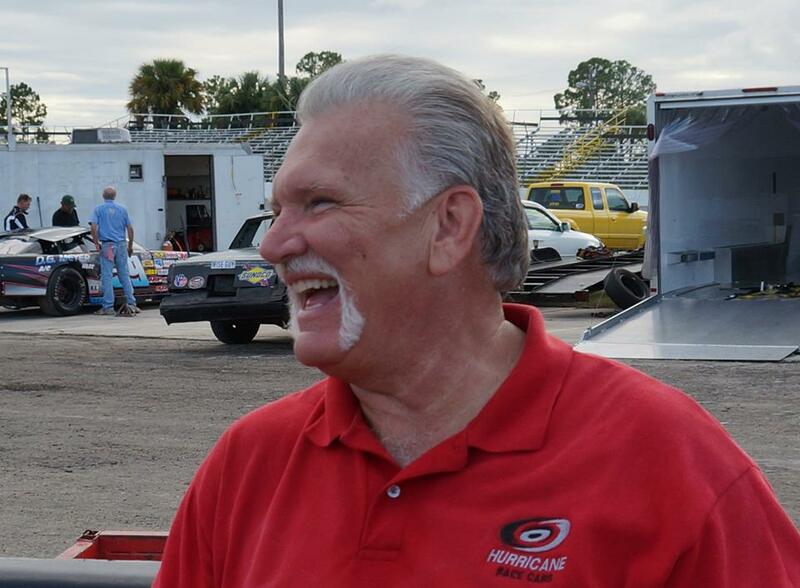 The December 7 TBARA race is definitely confirmed, and Moya is working on the advertising plan for the race, to include television and radio advertising to the greater Orlando market. 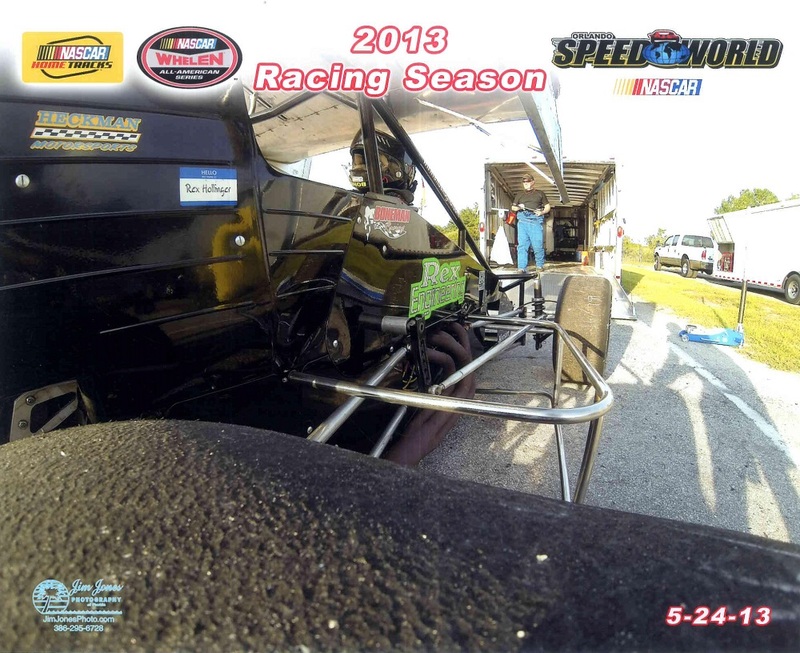 They have also printed up flyers for the TBARA race that they will hand out during the big “Night of Fire” event at the drag strip to try and get some crossover promotion going. And since many of you have asked, yes, your pits wristbands from the TBARA rainout earlier this year will be honored. 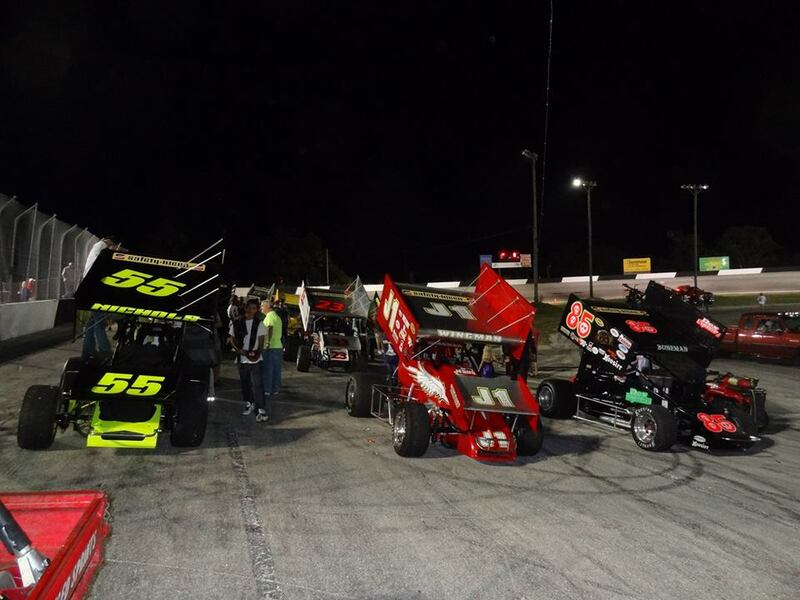 There is also a big Crash-A-Rama event at OSW coming up on November 29 and Rex is working on getting a few sprint cars out there on display as the Crash-A-Rama events represent one of the few times (at least over the past few years) where OSW is packed to the gills with fans. For 2014, OSW is going back to Friday nights, with big shows on Saturday nights, of which plans are to try and bring the TBARA in two or three times. 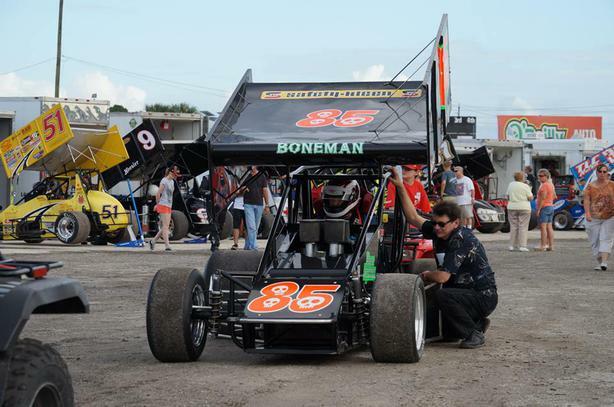 As we’ve seen at a few sprint car events this year, sometimes the safety team on hand can be spotty or not as in tune with the needs of sprint car accidents as we would like. Well Rex has worked with OSW and they are bringing the equipment from the drag track over, which includes a fully equipped ambulance and two fire fighting trucks with water and foam. 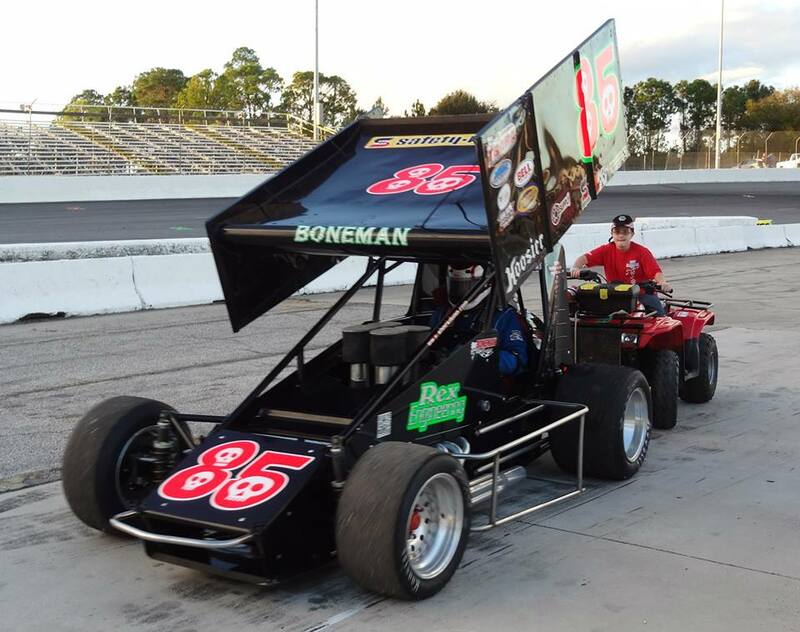 So when you’re at New Smyrna this weekend for the TBARA race, why don’t you swing by the #85 open trailer that Rex pulls to the track and thank him for all of his hard work. 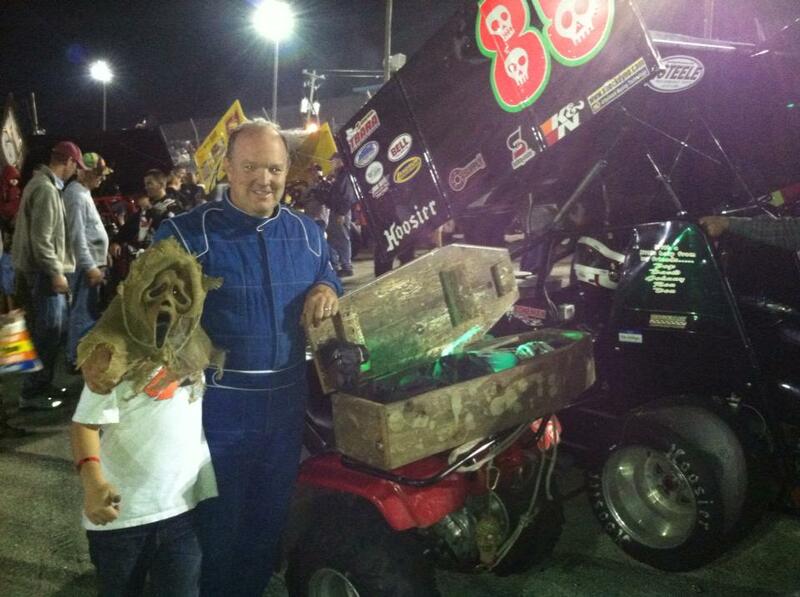 Racers and fans alike owe him an atta boy. This is Rex Hollinger. 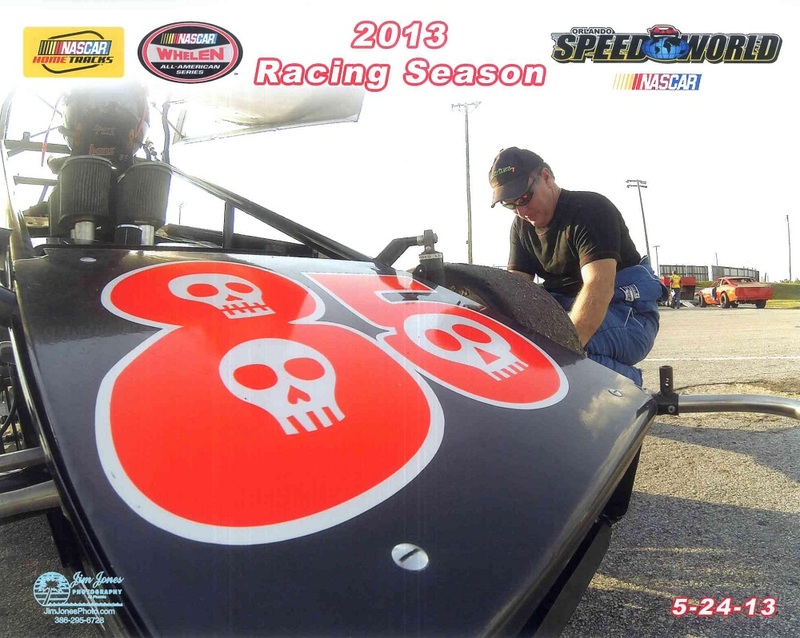 When not scaring local youth at race tracks during Halloween with his macabre props, he’s been working hard to pull off the TBARA race at Orlando SpeedWorld. We had our smallest field of the year, but it was a still a good night for TBARA. The crowd in the stands was huge, and they saw a good race. We even had a last lap lead change. It went ok for me too. My times were much better than in our race last September, and I stayed out of trouble again finishing 8'th. 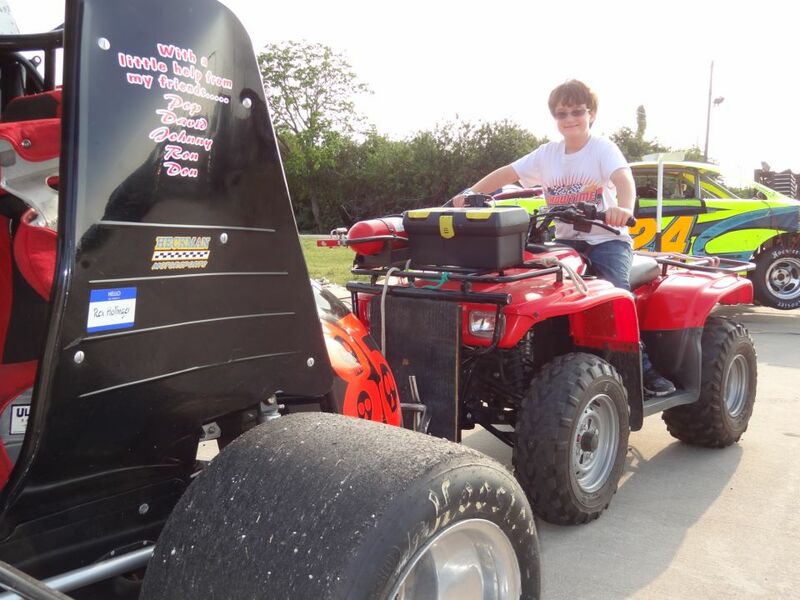 Check out that 4 wheel driver! 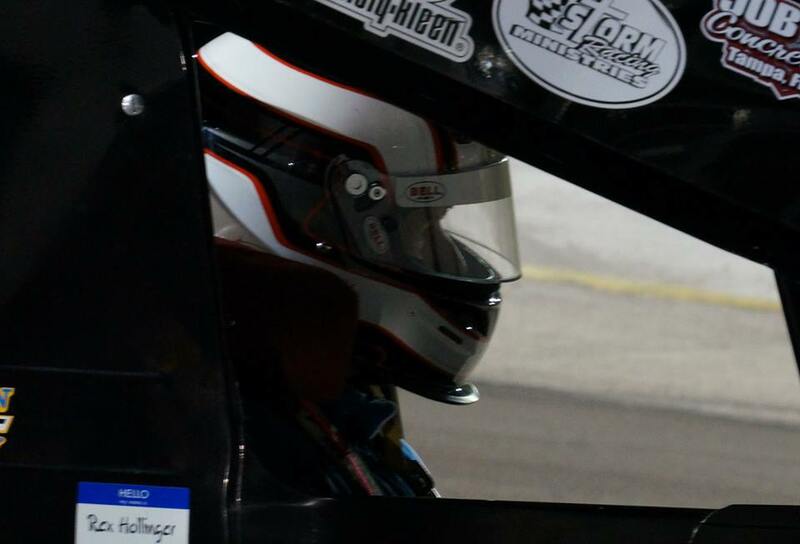 I got to race a sprint on my home track for the first time, and ended up on the pole for the feature. After a few laps, I settled into third and stayed there for half the race. Then the second place guy tangled with a lapped car, so I restarted in second. However, after the restart I slipped and several good cars got by so I ended up 7'th. 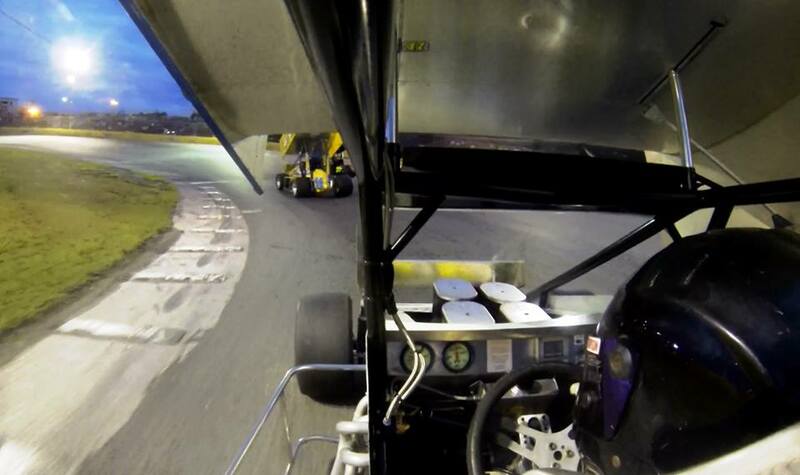 I love sprints at Speedworld! 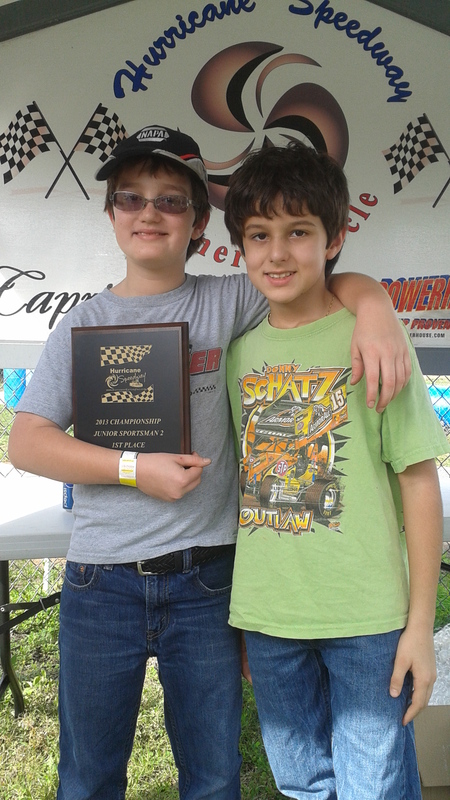 Steven won his first championship this year at Hurricane Speedway. He won the Junior 2 class, and scored 9 wins in 11 starts! So that about does it for our 2013 season. I ended up 7'th in TBARA points by finishing all 7 of our races. 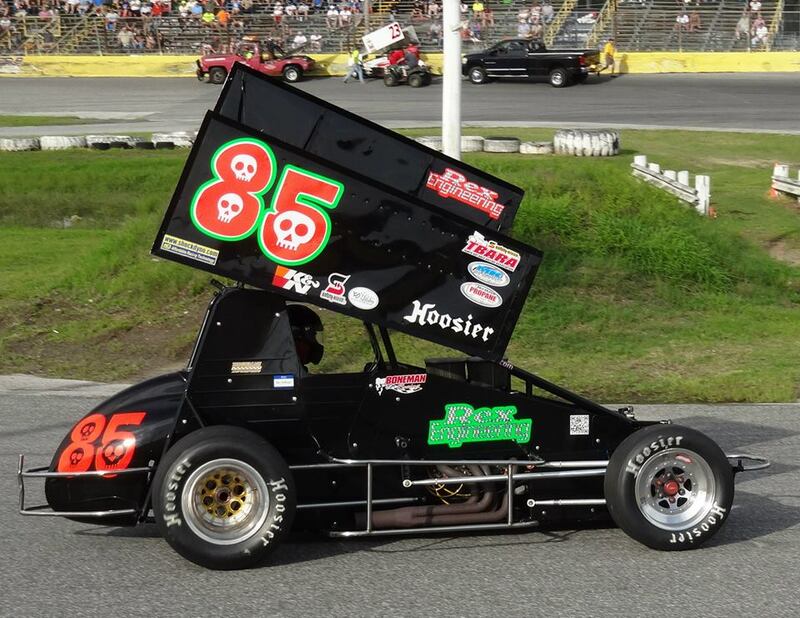 I ran 4 other nights at Showtime, so mix in 2 rainouts, 4 track display nights, then it turns out I had the sprint car out 17 times. I've also been the TBARA treasurer this year, and have invested some time in club management. 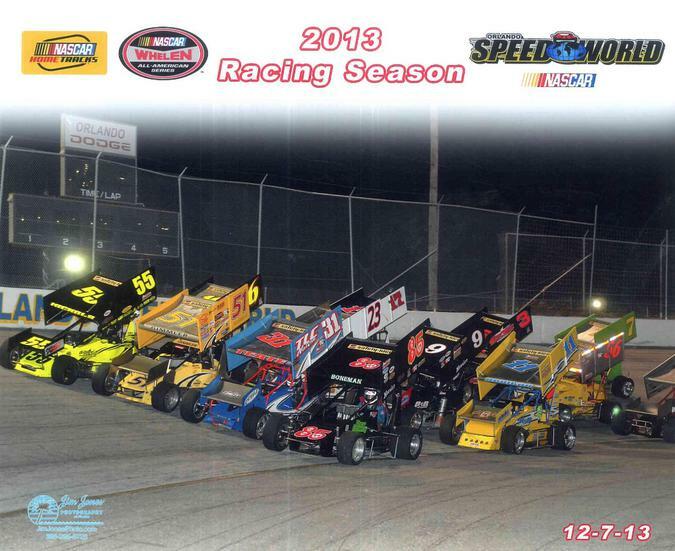 To this, add 14 kart racing nights, and remember that most of those were with 2 karts! Yes, I've been very busy doing what I love this year. So what was the best change this year? 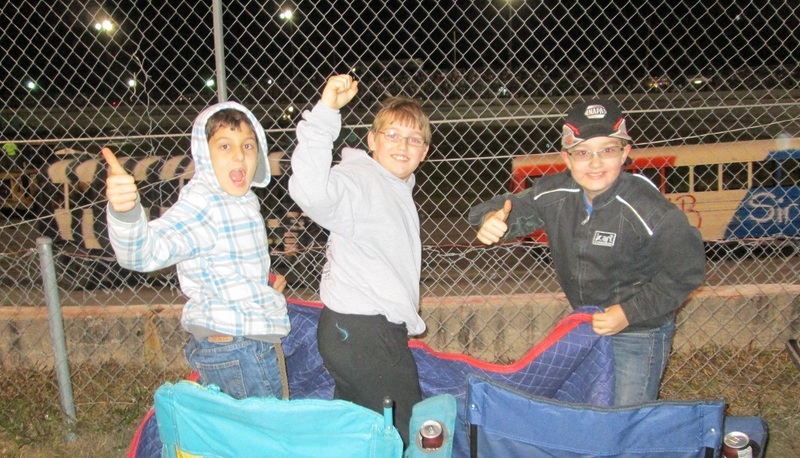 I love the way that my sons like coming to the races with me. Christian likes it, but Steven loves it, so I'll have one or better yet both boys with me from here on! 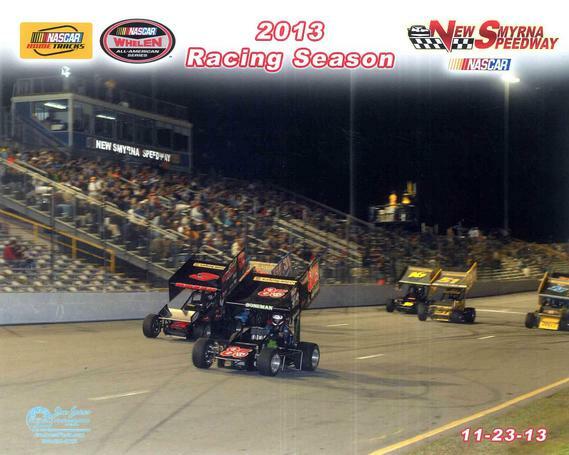 Our 2014 will look a lot like 2013, only more so! 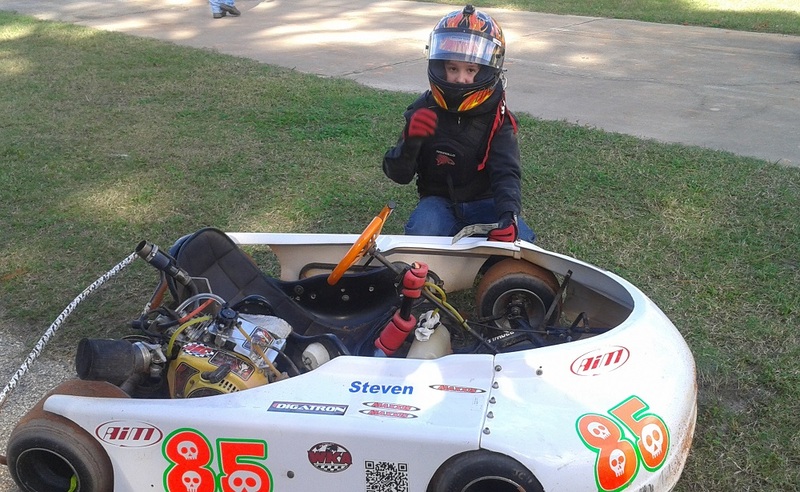 I'll be back in TBARA, the boys will be racing karts, and I think there will be a few surprises as Steven and Christian spread their racing wings a bit more. 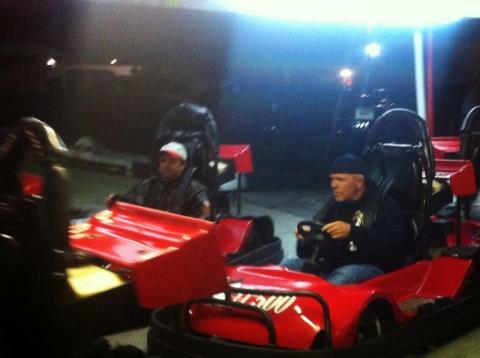 I bought this enduro car for a friend to drive, but I ended up behind the wheel in the CrashARama enduro. The little Acura is fast, but by half way I had two flat tires, so it was time to throw in the towel. 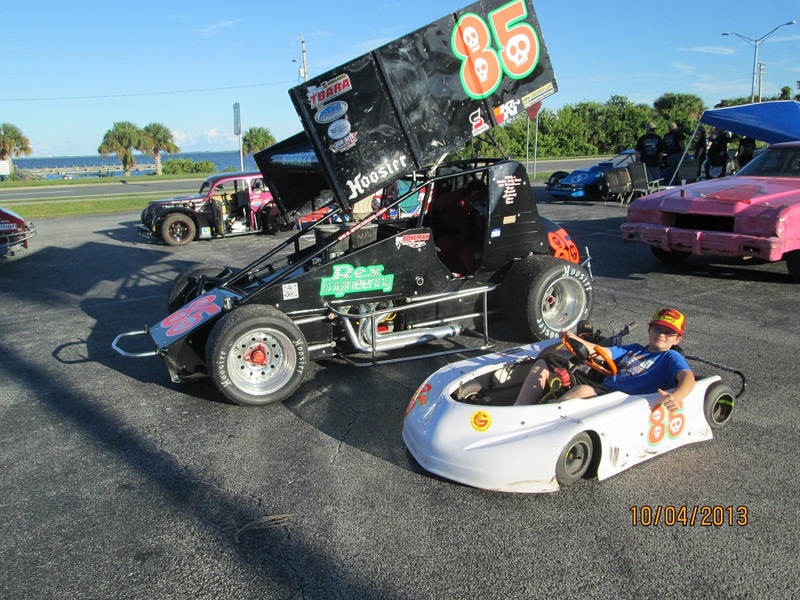 Drying off Speedworld on 9-14-13. Steven and I were driving around in the diesel truck that I use to pull the trailer. Luis Guilllen carried Steven's signature to victory!